See the documentation for more details and options. Use four 10-32 screws of 1 1/4" length and four nylock nuts to mount your limelight. Run two wires from your Limelight to a slot on your PDP, and add a 5A breaker. Finally, run an ethernet cable from your Limelight to your radio. That's it! See more language examples in the docs. 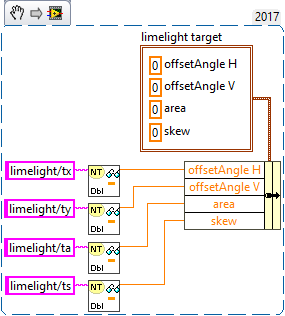 Drag the above image into LabView to generate code for Limelight! Limelight might work without any tuning, but tuning is as easy as dragging sliders. For more detailed information, tuning, and calibration, view the official documentation.